How is this for a totally random shoujo manga? 🙂 I purchased this mainly because it A) Was on sale (yay!) and B) has a really interesting cover. For some reason I really like the layout of the cover. The pose is somewhat unique and I like the angle. 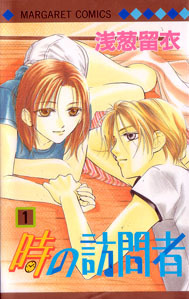 So many covers have the guy holding the girl or just a close up of a face or something 🙂 I had absolutely no idea what this was about, as I, in my manga buying frenzy, dropped it into my basket without even reading the title! Seriously, put me in a place where there is cheap manga, and I am awful, like a drug addict, piling up manga left and right, horrifying store cashiers with my manga mountain… ahem. This series, as far as I can tell, runs for three volumes, though I don’t have all of them yet. Anyway, on to the story. This is actually a fantasy series! It all begins with an odd encounter at night in a park. Touko-chan is walking home from a convenience store when she comes across a handsome guy who looks a bit strange. What he says when he sees her is even more strange. He asks her wat month, day, and year it is! Touko things this guy is really weird, but she answers his question and goes along her way.